In 1958, after a string of critically acclaimed and successful albums, Miles Davis was searching for a new direction to take the music, and signs were pointing him off the chordal highway into a new jazz style: modal. His innovations would open up the world for improvisers. He recruited key players with the potential to solidify his new approach, forming his famed sextet with rising jazz giants John Coltrane, Cannonball Adderley, Bill Evans & Wynton Kelly, Paul Chambers and Jimmy Cobb. Miles hired the little-known Evans because he needed a pianist who was into the modal thing. Davis and Evans both had developed personal voices characterized by a melodic flow that suggested, rather than defined, musical structure. It was his relationship with Evans that created the spark that resulted in the album Kind of Blue. In only two impromptu sessions in March and April of 1959, Davis’ sextet created a tour de force; five original tunes built on simple scales. Davis is committed to getting something spontaneous out of his musicians. The entire album was composed as a series of modal sketches and was conceived only hours before the recording dates. The outcome? Pure inspiration, and the stuff of legend, an album made up of the first full take of each tune, captured at the historic Columbia 30th Street Studio. The album was originally released on Columbia Records in 1959, stunning the jazz world by practically creating a new language of music. Its influence goes far beyond jazz. 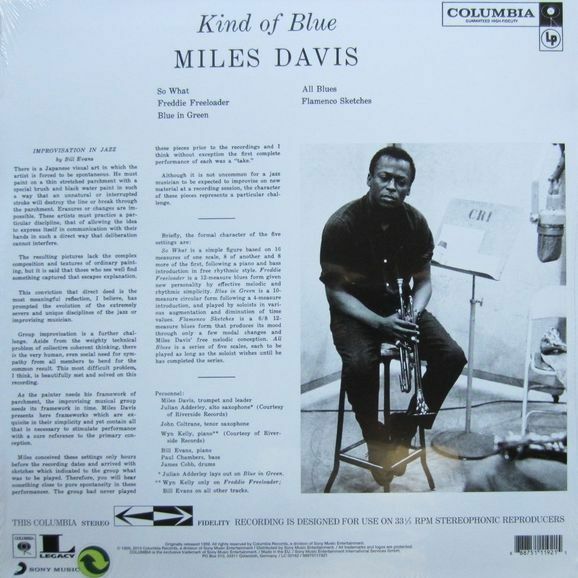 Kind of Blue is universally considered to be one of the best albums of all time, of any genre. More than fifty years later, Kind of Blue, the epitome of spontaneous invention, is still the best selling jazz album ever.